The Bible contains announcements of the future—many of which have already come to pass! Look at three examples of fulfilled prophecy that confirm the Bible. Alexander the Great fulfilled several prophecies that confirm the truth of the Bible. 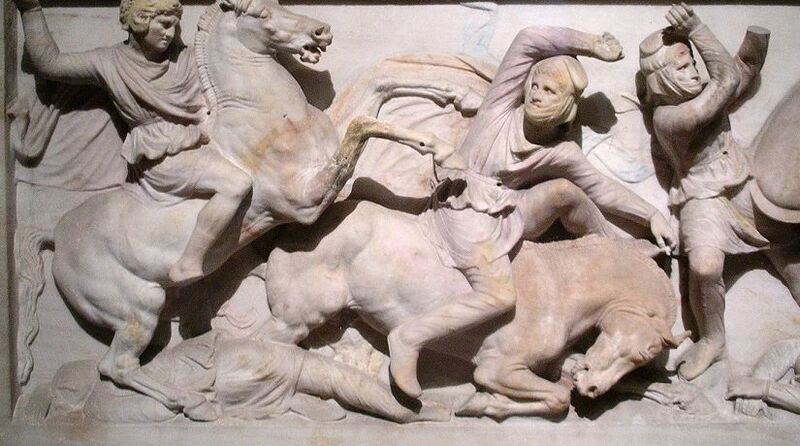 Shown here is a detailed view of the Alexander Sarcophagus located in the Istanbul Archaeology Museum. Here Alexander fights the Persians at the Battle of Issus (Wikimedia Commons). Is it possible to know the future in advance? Many people might be skeptical of such a proposition. And yet there is a tremendous fascination in our world with trying to predict the future. Steady streams of polls try to anticipate the results of political elections. Fans and media experts try to guess the outcomes of major sporting events before they take place. Some people even announce that the world is ending on a specific date! However, these various efforts to predict what will occur are often wrong. As a result, people may dismiss the ability of human beings to determine without fail what will happen in the future—and rightfully so. Human beings are not capable of anticipating future events with complete accuracy. Only God has the power to announce the future in advance—and to always be correct with His announcements! The Bible states that its contents are “given by inspiration of God” (2 Timothy 3:16), meaning that Scripture is a record of God’s own words. A significant portion of the Bible falls into the category of prophecy—announcements in advance of events to take place in the future. How should we view these biblical prophecies? What standard should we use to judge prophecy? The Bible does not try to “play it safe” with respect to announcing what will happen in the future. It does not contain a disclaimer that a prophecy only has a 75 percent chance of being accurate. Instead, Scripture repeatedly asserts that if a prophecy does not come to pass, it is not from God. As the prophet Moses stated to ancient Israel, “When a prophet speaks in the name of the Lord, if the thing does not happen or come to pass, that is the thing which the Lord has not spoken” (Deuteronomy 18:22, emphasis added throughout). Only God can accurately announce the future with certainty because He alone has the power to make that future happen! God cannot lie (Titus 1:2). Thus each unconditional prophecy in the Bible will ultimately be fulfilled. Most of the prophecies recorded in the Bible have not yet come to pass. However, a number of biblical prophecies have been fulfilled, some of them in incredible ways! This article will give a brief overview of three such fulfilled prophecies as evidence of the truth of the Bible. In other words, God stated that Cyrus—referring to the first ruler of the Medo-Persian Empire, Cyrus the Great—would order the rebuilding of Jerusalem and the temple. This verse is incredible because Isaiah recorded this statement many years before Cyrus was even born! Although we do not know the exact date when Isaiah was inspired to write this passage, scholars generally accept that Isaiah was born in the eighth century B.C. During Isaiah’s lifetime, the nation of Judah had not yet gone into captivity, and the temple built by Solomon was still standing. And yet God announced at that time that someone named Cyrus would order the temple to be built! Cyrus the Great came to power in the sixth century B.C. and established the Medo-Persian Empire. In 539 B.C., he conquered Babylon, which had taken the nation of Judah into captivity and destroyed the temple decades earlier. As a result of the decree by Cyrus, a number of Jews returned to Jerusalem and began to rebuild the temple, fulfilling the prophecy that Isaiah had recorded many years earlier. One man who lived through the Medo-Persian conquest of Babylon was Daniel the prophet, who wrote many incredibly detailed accounts of what would happen in the future. Prior to the overthrow of Babylon, God gave Daniel a vision of a ram expanding its territory, but ultimately being trampled by a male goat (Daniel 8:1-8). This vision pointed to the Medo-Persian Empire, represented by the ram (Daniel 8:20), and the Greco-Macedonian Empire, represented by the goat (Daniel 8:21). Before either of these empires began, God had announced them! In Daniel’s vision, he saw that the goat had a large horn between its eyes, representing its first king (Daniel 8:5, 21). The first king to rule over Greece after overthrowing the Medo-Persian Empire was Alexander the Great, who rapidly defeated Persia after beginning to attack it in 334 B.C.—more than 200 years after Daniel’s vision. Daniel’s vision showed that eventually “the large horn was broken, and in place of it four notable ones came up toward the four winds of heaven” (Daniel 8:8). This symbolized the fact that “four kingdoms shall arise out of that nation [Greece under the rule of Alexander], but not with its power” (Daniel 8:22). A subsequent prophecy restated what would take place, and added the information that the four rulers who succeeded Alexander would not be from his family (Daniel 11:1-4). History shows that the prophecies regarding Alexander were fulfilled in accurate detail. After his rapid rise to power, he died at a young age. Alexander’s kingdom was subsequently divided into four parts that were ruled by his generals. The first-century Jewish historian Flavius Josephus provided a fascinating validation of the fact that Daniel recorded these prophecies before the time of Alexander. Discussing the events when Alexander came to Jerusalem (before his ultimate victory over Persia), Josephus wrote the following: “And when the Book of Daniel was showed him [Alexander], wherein Daniel declared that one of the Greeks should destroy the empire of the Persians, he supposed that himself was the person intended” (Antiquities of the Jews, Book 11, chap. 8, sec. 5). Alexander was able to see the prophecies that had been written of him in the book of Daniel—prophecies that had been recorded more than 200 years earlier! The conclusion of the vision in Daniel 8 and the vision in Daniel 11 provide details about an event that would occur long after Alexander’s death. As described in Daniel 8:8, four horns arose from the large horn that was broken—representing Alexander’s four generals coming to power. Daniel 11 gives a detailed prophecy of two of the empires that grew out of Alexander’s. This eventually led to the time of a vile king whose forces would “defile the sanctuary fortress; then they shall take away the daily sacrifices, and place there the abomination of desolation” (Daniel 11:31). Who was this? History shows that a fulfillment of this prophecy can be found in Antiochus Epiphanes, a Seleucid king who ruled from 175 to 164 B.C. Additional detailed prophecies about the Seleucids (kings of the North) and Ptolemys (kings of the South) can be found in Daniel 11. Antiochus persecuted the Jews and made all forms of Jewish worship illegal, including the daily sacrifices. He established the worship of the Greek god Zeus in the temple in Jerusalem and sacrificed pigs on the temple altar. This desecration of the temple is referred to in Daniel 11:31 as “the abomination of desolation.” There will be a future fulfillment of this abomination at “the time of the end” (Daniel 12:9-11), but the actions of Antiochus provided a fulfillment of this prophecy as well. This article has only briefly covered three biblical prophecies that have been fulfilled, but there are many more that could be discussed. For example, the “70 weeks” prophecy provided a precise dating of Jesus Christ’s ministry on this earth. When faced with such detailed and accurate accounts, skeptics typically fall back on the same argument: the prophecies must have been written after the events in question. However, this argument quickly loses credibility when it must be repeatedly applied to each biblical prophecy that has come to pass. When we consider the issue with an open mind, it becomes clear that fulfilled prophecies are evidence that the Bible is true and that it is the Word of God! But is accepting prophecy as a proof of the Bible enough? Or does God expect further action on our part? After describing the vision of the transfiguration of Jesus Christ, the apostle Peter indicated what our approach should be toward prophecy: “And so we have the prophetic word confirmed, which you do well to heed as a light that shines in a dark place, until the day dawns and the morning star rises in your hearts; knowing this first, that no prophecy of Scripture is of any private interpretation, for prophecy never came by the will of man, but holy men of God spoke as they were moved by the Holy Spirit” (2 Peter 1:19-21). The record of fulfilled prophecies should motivate us to look to the entirety of God’s prophetic Word as our “light” to show us what is yet to come. Biblical prophets frequently spoke of the establishment of the Kingdom of God at Christ’s return. We can be sure that the prophecies in Scripture of God’s future Kingdom are true, because we have the evidence of biblical prophecies that have already come to pass. The knowledge that God’s Kingdom is coming should thus motivate us to make sure that we will be spiritually ready when Christ does return: “Therefore, beloved, looking forward to these things, be diligent to be found by Him in peace, without spot and blameless. … You therefore, beloved, since you know this beforehand, beware lest you also fall from your own steadfastness, being led away with the error of the wicked” (2 Peter 3:14, 17). It is not enough to just learn about what is coming; God also expects us to obey Him as a result of that knowledge! So is it possible to know the future in advance? Yes—through the prophecies recorded in the Bible, which are confirmed by the many that have already been fulfilled. But unless we take action and diligently strive to change according to what God’s Word tells us, our knowledge of the future as revealed in the Bible will ultimately be meaningless. God has an incredible plan in store for humanity—to be children in His family for all eternity. For those who accept God’s calling and are faithful to the end, that future is certain. Will you be part of it?